Categories: Condiments/Sauces, Groceries. 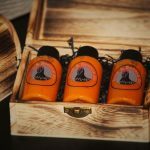 Tags: Belfast, Belfast Hot Sauce, carolina reaper, carolina reaper chilli, extra extra hot, Extra Hot Sauce, extra hot wing sauce, extra spicy, Habanero, Habanero Chilli, Hot Sauce, Hottest BBQ Sauce, hottest chili, hottest chilli, Hottest Sauce, Ireland, Irish, lime, Northern Ireland, really hot sauce, Rock A Doodle Do, Spicy, stupidly hot sauce, UK, United Kingdom. 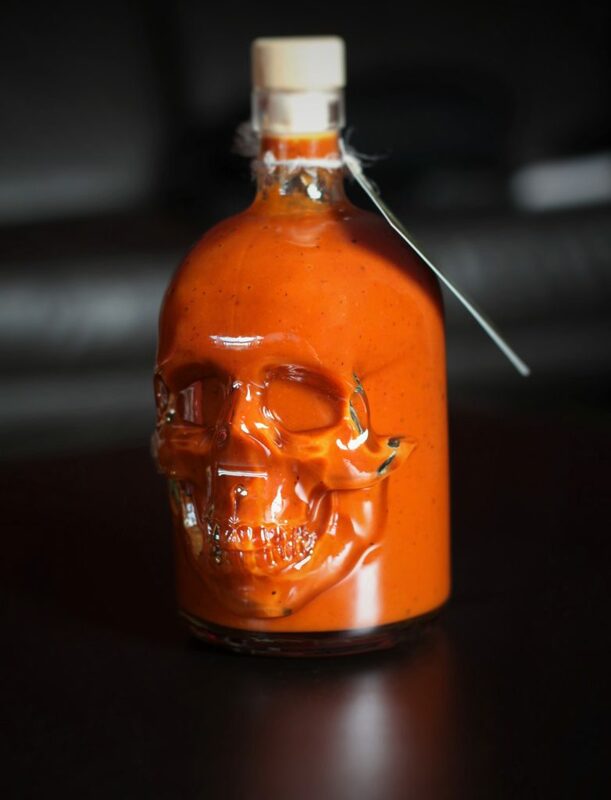 Our ‘Reaper’s Skull’ extra hot sauce blends fresh fruit & veg with some of the hottest chillies in the world to create an extra hot, usable sauce that can be used to liven up any meal! Thanks to the heat levels of the Carolina Reaper Chillies, this isn’t a sauce for the faint of heart. 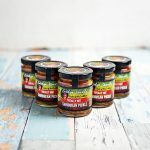 However, the heat is perfectly balanced with mango and lime, and char grilled onions and peppers to ensure that this is a hot sauce that you want to use over and over again! 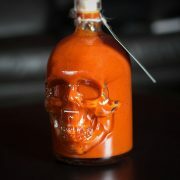 This premium sauce comes in a lifelike, quality, skull shaped bottle that warns of the pain and suffering that is contained within.